These two transformer tests are performed to find the parameters of equivalent circuit of transformer and losses of the transformer. Open circuit test and short circuit test on transformer are very economical and convenient because they are performed without actually loading of the transformer. Open circuit test or no load test on a transformer is performed to determine 'no load loss (core loss)' and 'no load current I0'. 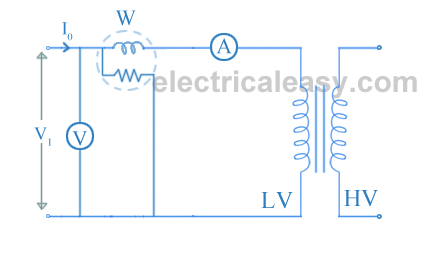 The circuit diagram for open circuit test is shown in the figure below. Usually high voltage (HV) winding is kept open and the low voltage (LV) winding is connected to its normal supply. A wattmeter (W), ammeter (A) and voltmeter (V) are connected to the LV winding as shown in the figure. Now, applied voltage is slowly increased from zero to normal rated value of the LV side with the help of a variac. When the applied voltage reaches to the rated value of the LV winding, readings from all the three instruments are taken. The ammeter reading gives the no load current I0. As I0 itself is very small, the voltage drops due to this current can be neglected. The input power is indicated by the wattmeter (W). And as the other side of transformer is open circuited, there is no output power. Hence, this input power only consists of core losses and copper losses. As described above, no-load current is so small that these copper losses can be neglected. Hence, now the input power is almost equal to the core losses. Thus, the wattmeter reading gives the core losses of the transformer. Sometimes, a high resistance voltmeter is connected across the HV winding. Though, a voltmeter is connected, HV winding can be treated as open circuit as the current through the voltmeter is negligibly small. This helps in to find voltage transformation ratio (K). Iμ = I0sinΦ0 and Iw = I0cosΦ0. X0 = V1/Iμ and R0 = V1/Iw. Hence, it is seen that open circuit test gives core losses of transformer and shunt parameters of the equivalent circuit. The connection diagram for short circuit test or impedance test on transformer is as shown in the figure below. The LV side of transformer is short circuited and wattmeter (W), voltmere (V) and ammeter (A) are connected on the HV side of the transformer. Voltage is applied to the HV side and increased from the zero until the ammeter reading equals the rated current. All the readings are taken at this rated current. The ammeter reading gives primary equivalent of full load current (Isc). The voltage applied for full load current is very small as compared to rated voltage. Hence, core loss due to small applied voltage can be neglected. Thus, the wattmeter reading can be taken as copper loss in the transformer. Therefore, equivalent reactance of transformer can be calculated from the formula Zeq2 = Req2 + Xeq2. These, values are referred to the HV side of the transformer. Hence, it is seen that the short circuit test gives copper losses of transformer and approximate equivalent resistance and reactance of the transformer. From the above transformer tests, it can be seen that Cu loss of a transformer depends on current, and iron loss depends on voltage. Thus, total transformer loss depends on volt-ampere (VA). It does not depend on the phase angle between voltage and current, i.e. transformer loss is independent of load power factor. This is the reason that transformers are rated in kVA.